For some divers, their very first dives are done off a boat and this seems like the most natural way to dive before training or for fun dives, but divers that start diving from shore are often somewhat hesitant to hop in off a boat. While in many aspects boat diving is easier physically, the idea of jumping into deep water rather than wading in from a beach or easing off a dock can be somewhat intimidating. Every dive boat or skiff is different and the techniques used may differ greatly from one boat to another, but there are some fundamental concerns and skills that should be considered when diving off a boat. Here’s a brief list of some of those considerations. Please feel free to add your own advice as a comment. When diving from a boat divers are often doing sites that are brand new to them. The boat captain or crew will (should) give a briefing on the site itself with suggestions or instructions on how to dive it. 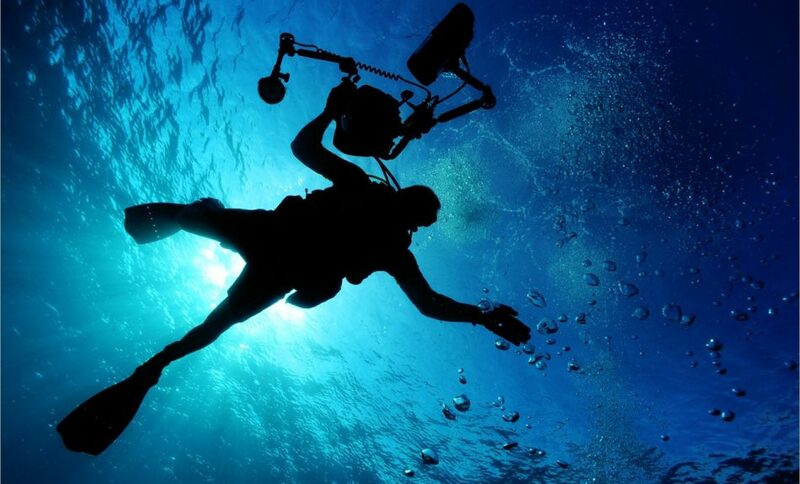 Some sites will have a “best” way to execute a dive, but many safe options but other sites will only have one safe method and divers should be aware of this – if it is mentioned in the briefing that the dive must be done a particular way (directionally, depth limits, time limits, etc) then it is prudent to heed such advice. This is often true of drift dives and time limits. If you are uncertain whether something is a recommendation or a hard and fast rule, ask for clarification. Briefings should include some information about dive site topography and directional information for navigation purposes; suitable depth limits; current information; possibly time limits; points of interest; possible hazards; emergency procedures, including recall procedures; marine life and other highlights and various other information specific to the region or particular site. It may include buddy team assignments or group organization. It will often include gas management strategies. Most of this information should be reiterated and limits and strategies refined within buddy teams. Pay attention during briefings and respect others on the boat that may be trying to listen. This is especially important to keep in mind if you’re diving a site you are very familiar with because not everyone else aboard may be as comfortable with it and could be relying on the briefing. Boat briefings are as important as dive briefings. Captains or crew should familiarize divers with the boat layout, safety features (pfds, life rafts, et cetera) and procedures. Briefings will usually include suggestions or directions on how to enter the water and re-enter the boat safely. Some boats will have swim grids to giant stride off of or do a controlled seated entry, while others may require divers to back roll into the water. Some will have lines deployed for divers to use to get back to the boat post-dive, while others will not be able to do this for safety reasons. Boat briefings will likely include a few rules, often for safety, sometimes ease of operation divers may not be allowed in certain areas of the boat or perhaps just not will in wet and/or bulky exposure protection. It is best to respect these rules both to keep the peace and to stay safe. If the crew neglects to provide a boat briefing it is wise to ask questions, lots of questions, in fact, it may be best to ask for an orientation to the boat for yourself and other divers for safety and comfort. And just like during a dive briefing be aware of others around you. Dive teams should be determined well before entering the water. They should position themselves strategically on the boat so that they can assist each other gear up and perform a buddy check prior to entering the water, if that is advisable. Teams should discuss dive plans, including depth limits, dive time, decompression or safety stop strategies, separation procedures, direction and individual roles prior to the dive and as appropriate according to the dive briefing provided. “We’ll just follow the Divemaster…” does not constitute a dive plan. Buddy teams should coordinate gearing up such that they are ready to enter the water at the same time, so neither one is waiting in the water for an extended period, particular in the case that there is any surface current. As mentioned earlier, buddy teams should gear up at approximately the same pace. This way, one diver isn’t waiting in heavy gear or potentially cold, choppy water or in currents for very long. Gear assembly is sometimes done at the dock, sometimes while underway and occasionally once at the site. This should be made clear by the boat staff or captain. It may or may not be safe to be attending to your gear while the boat is underway. Dive boats can be fairly restrictive spaces and it helps to practice some courtesy. Divers should keep track of their gear, being aware of any overflowing their designated deck space. When gearing up, don’t be afraid to politely ask for help from crew or other divers, but this is a good time to communicate with your buddy team and help each other out. Be aware of flailing yourself and your gear around whilst gearing up in tight spaces. Not all dive boat ladders are created equal. It may be a good idea to ask about the ladder and scope it out on a new boat. This is particularly important if you are still adjusting to the weight of your dive gear or have any mobility issues. However, some ladders or entries can be difficult for even fit, seasoned divers. Briefings will often include advice on how to best deal with a ladder and whether you will be able to pass up your fins and/or other gears. This will largely depend upon the dive briefing conducted aboard. Be very aware of currents and buddy separation both underwater and at the surface (before and after the dive). Divers may be expected to stay as a group or break off into buddy teams. It can be difficult to stay together as a large group on some sites due to current or other factors, besides large groups together tend to stir up silt and can intimidate marine life. Sometimes it is best to stay together for safety, though. Again, this should be included in dive briefings.